Until recently, all my cut and sew sweater sleeves had set-in sleeves. I either "dropped the sleeves in the hole" or sewed them in flat, but in the end they were definitely set in and my shoulders were stable. 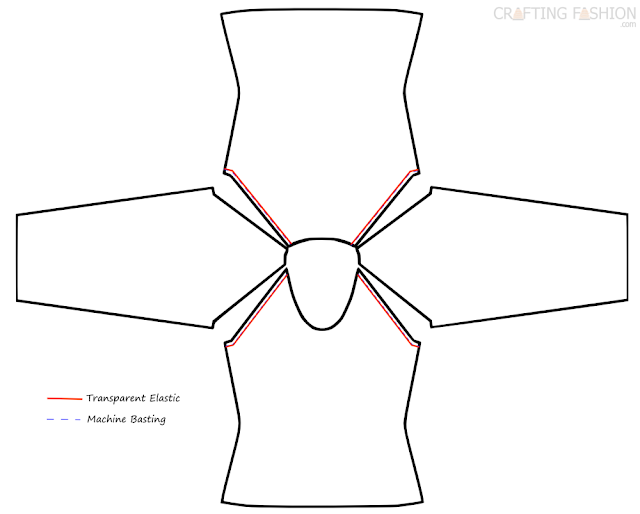 It's necessary to stabilize the shoulders of the cut and sew sweater for one very good reason -- gravity. The weight of the sleeve will pull down on the shoulder seam. If that seam hasn't been stabilized, the seam will stretch and "grow". This time it's not the temporary stabilization used to keep a cut edge from raveling. 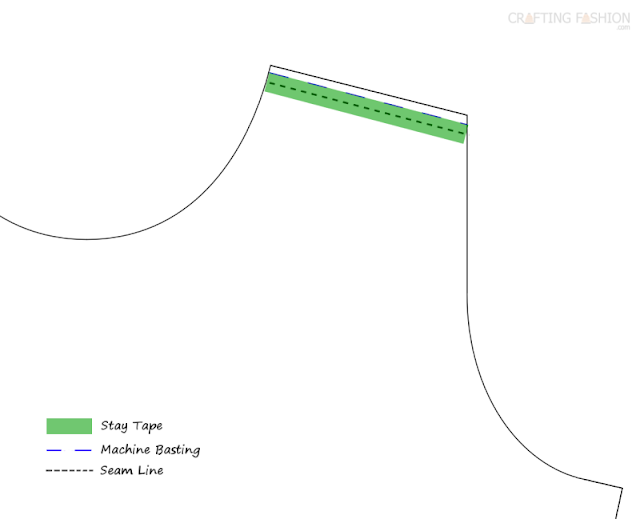 I see this as permanent stabilization, and there are several ways to do this. I use good old fashioned Stay Tape , so simple, lightweight and reliable. 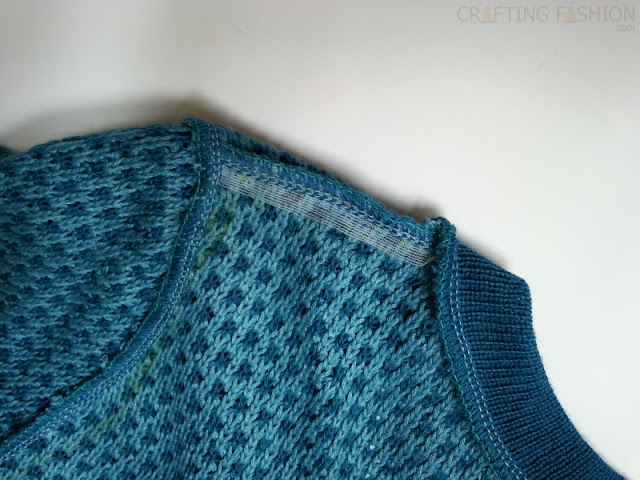 The following steps are really an expansion of "Step 1" from Steps for Sewing a Sweater. I hope the extra explanations make things clearer. Step 2. Cut a second piece of Stay Tape, identical in size to the first for the second shoulder. Step 3. Pin or glue-baste* the Stay Tape to the wrong side of the front shoulder (or back shoulder, if you prefer) centering it on the seam line. Step 4. (Optional) Machine baste the Stay Tape at the very upper edge of the tape. Step 5. With right sides together, pin (or use binder clips) to hold Front and Back pieces together. Step 6. With a balanced 4-thread overlock stitch, serge shoulder seams, removing pins (or binder clips) before they reach the blade. (The left needle sews on the seam line.) The blade doesn't cut the Stay Tape. It just trims the main fabric. If the blade does trim a little of the tape, don't worry about it. It's easy and worth it. 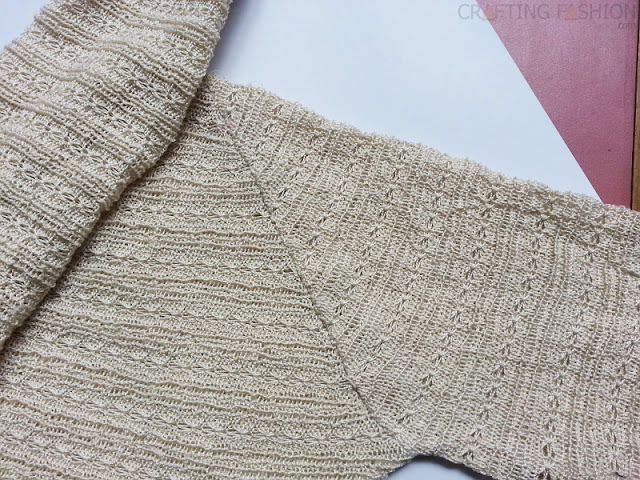 What's not so easy was what I decided to do last week -- a sweater with raglan sleeves, my Moonstone Sweater. Because the fabric I'm using has one of my open work designs, I decided to finally try transparent elastic for stabilizing. It was my very first time. For raglan seams I'd be stabilizing the front and the back because the sleeve slips in between. The red lines are where I placed the clear elastic. My research yielded no exact instructions on how to tape raglans. I ended up following the instructions entitled "To Tape an Armhole Seam" in Turbett's Revised Knit, Cut and Sew: Bk. 1 . These instructions were not supposed to be for a raglan; they were clearly for the armscye of a set-in sleeve. (Btw I have yet to do that for my set-in sleeves.) Needless to say, I had to modify the instructions greatly. I ended up taping in a way that was similar to my shoulder seams. By the 6th time (2 practices + 4 for reals), I felt confident. But so far, I much prefer woven Stay Tape or the fusible knit interfacing I've fooled around with, but never used in a garment. There exists a fusible knit stay tape. I may try this one day. Here's my problem with the clear elastic. I'm essentially sewing something stretchy to something else that's stretchy, one of which I want stabilized. Now it's true that the elastic has perfect recovery, but I feel I have no control over the stretch as I'm sewing it in. Maybe I just need practice, but I won't be using it again for quite awhile, especially since I have something that does work for me. If I must stabilize something lacy again, and I don't have tape or interfacing that matches, perhaps I'll try dyeing the tape or interfacing. Has anyone tried this? Below is a pic of one of my raglan seams, still unsteamed, as I was afraid of deactivating my Solvy (Temporary) Stabilizer still in play at the neckline. (See previous post.) And since I'm assuming clear elastic melts at high temperature, I've gone over the seam with a very light pressing through cheesecloth with a dry(!) iron set at "silk". After my neckline is finished, and I wash the sweater to remove all the Solvy and chalk marks, and I've allowed it to air dry, I'll give the sweater a really good steaming. I'm hoping that the raglan seams will be nice and flat then. And even if they are unlumpy, I'm not going to use transparent elastic again for a very long time. *And now for a product I do love... I used the term "glue-baste" way back in Step 3, and the more I use this stuff, the more I love it. Next week, however, for better or worse, I plan to reveal my Moonstone Sweater. Now to finish that thing! Thank you for the tips! How do you feel about Elmer's school glue? I've used it for quilting a lot and it's basically just a starch that washes out. I haven't used it for clothes yet though so I was curious. I do use the 1/4" clear elastic when stabilizing the shoulder and raglan sleeves, pretty much because it stretches and doesn't stress the knits when trying to put on. (especially for kids..I make 'em tough for kids, stabilizing every seam with this stuff) I mark my elastic about 1 in shorter than every foot of seam.... so for a shoulder...give it a little tug.... but for side seams or raglans...about 1-2 inches, depending on size... then serge both layers of fabric and elastic at the same time the 1/4" is small enough to almost disappear into the seam so you can't feel it at all.... PS ever used the clear elastic for gathering? it will stretch 3 times it's length and is so fast on the serger and so strong.... love it! Thanks for posting the gathering tip.